Villa in Javea for sale Excellent new all-on-one-floor contemporary villa on a flat plot in,Javea. With views to the mountains. The villa combineds living-dining room, fully equipped kitchen, 4 bedrooms, 3 bathrooms (one of which is en-suite). Floor heating, airconditioning throughout and automatic window blinds. Outside there is a large open terrace and a covered one. Nice pool, low maintenance garden, automatic gate and bbq. The plot is fenced. New villas in Javea for sale, 3 bedrooms, 3 bathrooms, swimming pool, Key Ready. 23 plots available in this brand new development, walking distance to the sand beach in Javea. All villas are built with hot and cold air con, underfloor heating, home automation system, landscaped gardens and a private swimming pool included in the price. The price also includes the plot and building licences. Available with 3 or 4 bedrooms, There may be a supplement of 10.000€, 15.000€ or 20.000€ for selected plots. Contact us today for full price list, availability and payment schedule. All designs can be modified to your wishes, any changes will affect the final price. Jávea is located in an exceptional enclave, with beautiful beaches surrounded by valleys and mountains that form impressive cliffs, it also preserves the traditional beauty of the Mediterranean villages with their low, white houses. It is located in front of the Cabo San Antonio marine reserve and the Cabo de la Nao, next to the spectacular natural park of the Montgó, with its prominent massif so representative of the local landscape. Jávea also enjoys a unique microclimate, with 320 days of sunshine a year, making it one of the healthiest places in the world to live in says World Health Organization, a privileged climate that has given Jávea the title of best microclimate in Europe. Excelent food and weather, what more can you ask for?. New Modern in Calpe under construction with luxury qualities built in one of the best areas of the Costa Blanca, 1.5 km away from the beach between the towns of Moraira and Calpe. The villa has two floors: - Ground floor has a large garage for two cars, a bedroom, a bathroom, laundry room and staircase that leads to the upper floor. - High floor (main floor) consists of hall, a large open space with living room, dining room and kitchen with island, a bathroom, three bedrooms, one of them with bathroom en suite and an outside porch with barbecue in front of the pool. From the dining room and kitchen there is access to the porch with barbecue, to the outside terrace, to a large 10x4 pool and to the garden. Villa in Denia region near golf corse La Sella, Pedreguer, fantastic location with panoramic open views to the valley. Built in stone rustic style house with 40cm thick well isolatedwalls . It has a high ceiling spacious living room with fireplace, fully equipped high quality kitchen, naya, terrace with views to the swimming pool and the valley. On the ground floor it has a separate apartment. The plot is 4500 sqm fully fenced and 4000 sqm more in the back of the house. There is the possibility to extend the land adjoining the next plot on sale also. Private pool and garden. Electric door. Sunny all day south facing. Finca for sale in Denia, with guest house on a very large plot of 13,500m2, with stunning panoramic views. The property is perfect. The main house has 2 bedrooms, 1 bathroom, 1 shower room, 1 guest toilet, 1 living room, 1 dining area, 1 large open kitchen, 1 storage room, 1 laundry room and access to the very large patio, a covered terrace and to the many open terraces. There is a basement room of approx. 200 m2. The guest house has 1 bedroom, 1 shower room, 1 living -dining room, and an open plan kitchen and also access to the patio, covered and open terraces, also located in the patio is the summer kitchen with barbecue. The large pool of 14 x 10m has different terrace levels and also panoramic views. The extras include automatic irrigation system, TV/Tel connections, satellite dish, fitted wardrobes, wooden beams in the living dining areas, gas heating, fireplace, airco, gas water boiler, PVC windows, double glazing, PVC shutters, mosquito screens, many parking places and much more. Villa on three floors with a beautiful big garden with fruit trees and Mediterranean character in La Fustera (Benissa). 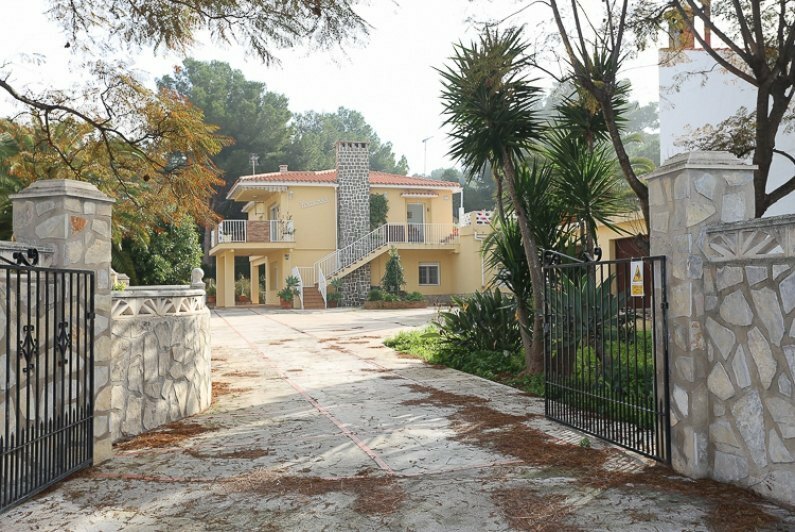 This villa is built in a plot with 1228m2, the total constructed area covers 327 m2. It’s a perfect home for those who value space and privacy. The house has three bedrooms and three bathrooms, a big fully equipped kitchen and two living rooms, one of them with a big fireplace. The villa also has a small terrace on the top floor and a big porch with a chillout area, dining area and barbecue on the main floor that leads to the open terrace, the swimming pool, and the garden with amazing views of the sea and of El Peñón de Ifach. The plot is totally fenced and has an automatic entrance door which leads to the garage and the storage room. 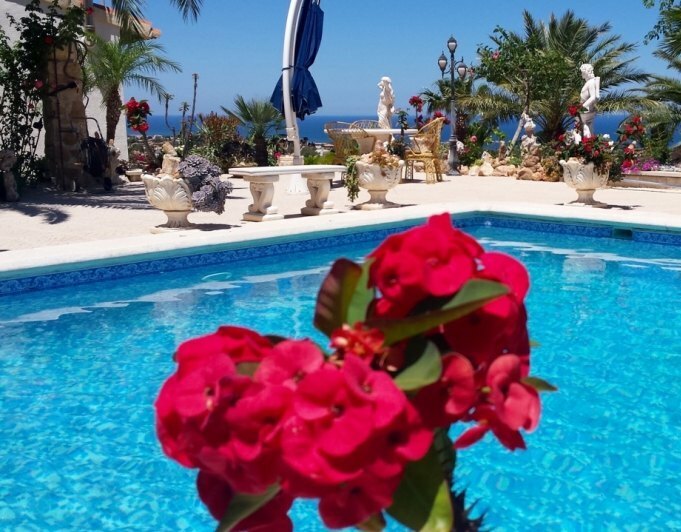 This beautiful Mediterranean villa is ideal for a family or for holiday rentals. With an excellent location, the house is located just 400m from the beach and 10 minutes from the center of Moraira in a very quiet street in La Fustera. Luxury 3/4 Bedroom Villa located in the popular Portet Valley.Very High Quality Finishing.This is a really luxury villa and kept in immaculate condition. Located in the Arnella area of Moraira the plot is very private and has lovely seaviews. There is a driveway with automatic gates leading to a double carport. Going through the front door of the villa we walk into an impressive hallway with marble stairs leading to a double bedroom with dressing area and ensuite bathroom. Continuing on from the hallway there is a dining room, lounge and seperate kitchen with utility area. There is a fireplace in the lounge and the central heating is gas underfloor through out.On this level there are two more bedrooms one with a stylish ensuite, also a guest bathroom. In the level below this is a spacious under build which could be made into a seperate apartment without much expense.Outside is a dream summer location with a fully fitted outside kitchen, swimming pool and well maintained gardens. Spectacular newly built villas for sale located in Javea. Built in the prestigious urbanization of El Rafalet, high quality Villas urbanization. Built in modern finishes and with first quality materials, these Villas are a reference of luxury construction on the Costa Blanca. This Villa in concrete will be built on a plot of 1047m2 and is included the construction of a pool of 8 x 4 m. The Villa consists of two floors, on the ground floor a large living room connected to the covered terrace, with swimming pool, with two bedrooms and two bathrooms (1 en suite). On the first floor two bedrooms and each one with a prsonal bathroom en suite for your comfort. the villa is finished in January 2019. Opportunity! lateral seaviews in the livingarea and from the upper terrace. 5 min to drive to Arenal Beach! Large villa of new construction, ready for release, with a built surface of 500 m² on a plot of more than 900 m². The villa is built with first quality materials, consists of 2 living rooms, 4 bedrooms with bathroom en suite, billiard room, fitness center,... in a unique environment, ready to enjoy the landscape and its surroundings. 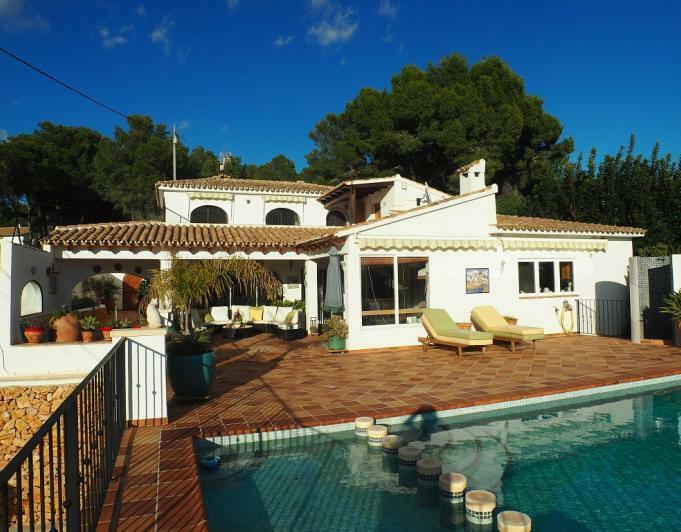 Villa in Javea for sale located in the Montgo area. Walking distance to supermarket. 5 minute drive to town and the beach. 4 bedrooms, 3 bathrooms and guest toilet. Large living/dining room, modern kitchen. Master suite with ensuite bathroom. 2 terraces upstairs with panoramic views.Gas central heating and aircon. 3 separate street entrances, 4 car garage and covered carport. 10x5m Pool with summer kitchen, terrace and garden. Underbuild can be converted in 2 apartments or more. Solar heated water. This building can be easily converted into a B&B, a restaurant or a medical clinic. Tax 1275 € year.